Get a new perspective on your HR challenges and new tools for meeting them confidently and legally. Ensure every step you take is legally sound and compliant with this HR law training course. Class Action lawsuits … hints of sexual harassment … regulations for interviewing and hiring. There's no end to the legal pitfalls you face every day on the job, and as a human resources professional, you're expected to stay on top of it all. Meeting that challenge requires continuing education that keeps you abreast of the latest legal changes along with the best employment practices. That is why this seminar is so important. 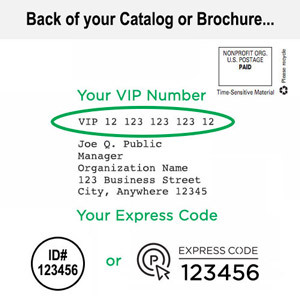 In one information-packed seminar, you'll learn what you need to know to handle the legal issues and gray areas you face every day. You'll also learn how to think like a lawyer, so you can anticipate and sidestep problems before they arise. This alone is well worth the price of the seminar. 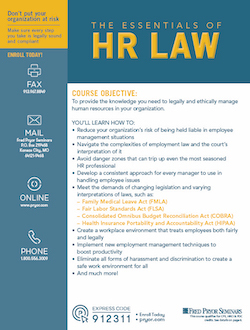 If you deal with the legal issues surrounding human resources as an HR professional — or even as a manager or supervisor — you need to enroll today! How to legally manage the latest benefits administration issue: Are domestic partners eligible for benefits?